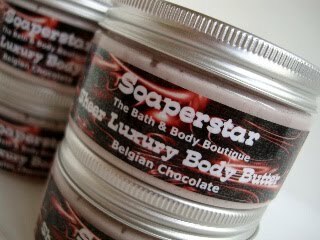 Soaperstar is proud to announce the introduction of their new Sheer Luxury Body Butters. Their Sheer Luxury Body Butters contain only the finest ingredients, many of them organic, so that your skin is treated to the luxury it deserves. 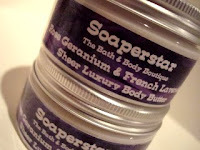 These Body Butters will help smoothe, hydrate and moisturise your skin as they nourish your skin. 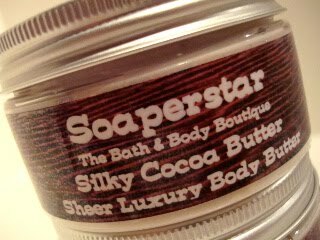 They the highest quality Shea Butter, Organic Coconut Oil, a mix of creamy white Cocoa Butter and Organic Dark Cocoa Butter alongside other ingredients so that your skin is nourished and left feeling wonderfully smoothe and silky. 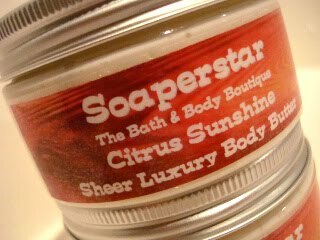 Fragrances include Belgian Chocolate - deep, rich and chocolately; Citrus Sunshine - a bright sunshine-y blend of Mandarin, Tangerine & May Change Essential Oils; Rose Geranium & French Lavender, a soft floral/herbal blend of essentail oils; Silky Cocoa Butter - smooth & seductive; and Vanilla Caramel - reminiscent of vanilla, rich and creamy with tiny hints of cinnamon and deep, rich, luxurious caramel. These are whipped body butters, that will melt immediately on contact with your skin. Take a little on your fingertips and rub into your hands before applying to the rest of your body. It is designed to sink into your skin quickly and easily whilst protecting and smoothing it. • Excellent for use on your feet—get them sandal ready for Summer! If you are interested in purchasing, please check out Soaperstar's Online Store. As a special introductory offer for the month of April only, these 100ml butters will cost you only €6.50 each (+ P&P) - regular retail price is €8.00 (+ P&P).